If you did not stop by and pre-order your Christmas Luncheon at last Wednesday's meeting, please place your order now by emailing Teresa and then pay when you come to the December meeting/luncheon. The voted choice was Quiche, salad, sweets and coffee/tea but for those with allergies to eggs or broccoli, there is an alternative of sandwiches with salad, sweets and coffee/tea for the same $7.00. 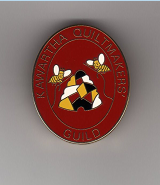 Oct. 17, 2018 - Participants from Bethany Garner's workshops in April (quilt design and dyeing) are asked to bring their quilts and/or dyed fabric for Show and Tell at the November meeting. Workshop sign-up will continue for the Quilt 'til You Wilt session on Nov 15 - payment of the $20 fee is required to register. We will also begin sign-up for the Bill Stearman workshop, Disappearing Nine Patch, to take place on Jan 3. Early Bird fee is $40 and will be accepted at the November and December meetings. - Check for the email in your spam folder. If it is there, move it to your inbox. This should direct further emails from me to enter your inbox. Tickets will be on sale at the next meeting. Please let Theresa Jacob know if you are planning on attending and have any food sensitivities. Lynda Hamersma would like to organize a sewing day and has tentatively booked the Douro Arena for Wednesday, April 17 from 9:00 until 3:00 at a cost of $20.00 per participant. Please contact Lynda if you interested. Heather Penwell asked if anyone would be interested in becoming a Certified Quilt Judge as a course is being offered at Quilt Canada in Ottawa. Please contact Heather if you are interested. Jan. 19, 2019 - Send a Fabric Postcard! Check out the message from our president Maureen McKeen in February's newsletter and be inspired to send out a fabric postcard to warm someone's heart. To help us with this, Heather Penwell has kindly done some investigation for us and put some information into a document, available here.